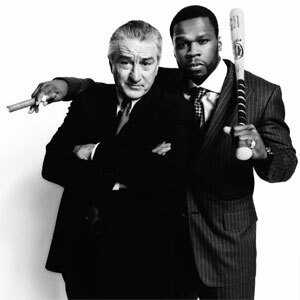 In 2008, 50 Cent proved his Hollywood star power when he starred alongside Robert DeNiro in the film, Righteous Kill. 50 Cent starring with DeNiro shocked fans who though he was washed up. Together, they shocked fans when they appeared on the VIBE cover together. Three years have passed since Righteous Kill and the two stars have gone their separate ways. 50 Cent has been working on several new projects over the past few years. The rapper has his own film company, which has been putting together several films. 50 is currently marketing his Things Fall Apart film. Jessy Terrero is one of the most-respected filmmakers in the hip hop industry. He was the mastermind by the cult classic, Soul Plane. Before venturing into full-length films, Terrerro produced several of the most-memorable music videos. This includes 50 Cent's 2003 hit with G-Unit, "Stunt 101." Following the success of the video, Terrerro produced several other films for G-Unit, forging a friendship with 50 Cent. Over the years, Jessy Terrero has continued to expand and he is currently working on his Freelancers film and has put together an all-star cast. Terrero was able to reunite 50 Cent and Robert DeNiro for his upcoming cop drama.